Chocolate Macarons Recipe - Let the Baking Begin! Chocolate Macarons are made with all the same ingredients as a regular macaron (egg whites, sugar and almond flour), but with the addition of cocoa powder. This recipe though is no ordinary recipe as even a novice baker that I was the first time I tried them (and every single time since) they have come out perfect. 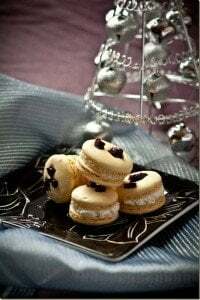 For a full guide with macaron troubleshooting tips check this Italian Method Macaron recipe. The technique for making the macarons is different, but the guide addresses potential problems that might arise in both the French (this one) and Italian method macarons. These were my first ever macarons that I made in 2007. At that time most of the had no idea what macarons were but there was so much mystique surrounding their preparation in the baker’s community that I just had to give them a try. I didn’t know much about macarons, but I did know that they were the most impossible cookies to get right. I had no idea what they were supposed to taste like, or what made a perfect macaron but even with everything I know now, I realize that my first ever batch came out perfect on the first try. Well, except for their size. They came out gigantic since I didn’t know that they were supposed to be bite-sized, and not palm-sized :D. I misread 2.5 cm for 2.5 inches, so that is why. Nevertheless! This is an amazing recipe! The instructions for the Chocolate Macaron recipe were so precise that it left no room for error which resulted in success even for a novice baker like I was. 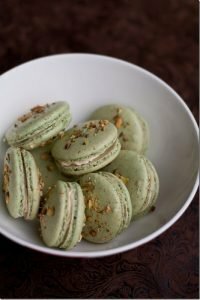 Pistachio Macarons – Filled with French Buttercream filling. Dulce de Leche Macarons – Filled with Dulce de leche Buttercream. Salted Caramel Macarons – Filled with Salted Caramel Buttercream. Line two large insulated baking sheets with parchment paper, or line two regular baking sheets and put on on top of the other baking sheet. Fit a large pastry bag with a plain 3/8 inch or 1/2 inch tip. Set these aside for the moment. If you've got almond powder, just sift it with the confectioner's sugar and cocoa. If you're starting with almonds, place the whole almonds, sugar, and cocoa in the work bowl of a food processor and process until the mixture is as fine as flour, or at least 3 minutes. Although the almonds may look as though they're pulverized after a minute or so, they won't be: The nuts really need 3 to 5 minutes to be ground to a powder or flour. When the almonds are ground, using a wooden spoon, sift the mixture through a medium strainer. For this recipe to succeed, you need 1/2 cup of egg whites, which means using 3 large egg whites plus part of a fourth white. Once the eggs are measured, they need to be brought to room temperature so they can be beaten to their fullest volume. To do this, microwave the egg whites in 5-10 second intervals for about 1 minute, stirring after each stop. Beat the egg whites at low to medium speed until they are white and foamy. Turn the speed up to high and whip them just until they are firm but still glossy and supple - when you lift the whisk, the whites should form a peak that drops just a little. Leave the whites in the mixer bowl or transfer them to a large bowl and, working with a rubber spatula, fold the dry ingredients gently into the whites in three or four additions. Don't worry if the whites deflate and the batter looks a little runny - that's just what's supposed to happen. When all the dry ingredients are incorporated, the mixture will look like a cake batter; if you lift a little with your finger, it should form a gentle, quickly falling peak. It is better to undermix, then overmix. Overmixed batter will produce hollow macarons or macarons with a very thin and brittle shell. Spoon the batter into the pastry bag and pipe it out onto the prepared baking sheets. Pipe the batter into rounds about 1 inch in diameter, leaving about an inch between each round. When you've piped out all the macaroons, lift each baking sheet with both hands and then bang it down on the counter. Don't be afraid - you need to get the air out of the batter. Set the baking sheets aside at room temperature for 15 minutes while you preheat the oven. Center a rack in the oven and preheat the oven to 425F. To remove the macaroons from the parchment - they should be removed as soon as they come from the oven - you will need to create moisture under the cookies. Carefully loosen the parchment at the four corners and lifting the paper at one corner, pour a little hot water under the paper onto the baking sheet. The water may bubble and steam, so make sure your face and hands are out of the way. Move the parchment around or tilt the baking sheet so that the parchment is evenly dampened. Allow the macaroons remain on the parchment, soaking up the moisture, for about 15 seconds, then peel the macaroons off the paper and place them on a cooling rack. When the oven is at the right temperature, repeat with the second sheet of macaroons. Remove from the parchment as directed above and let cool. Follow the recipe in the Cream Cheese Buttercream recipe. Pair the macarons by size. Fill half of the macaron shells with a dollop (about a 1 tablespoon) of the Cream Cheese Buttercream. Sandwich with the matching half and press together to adhere. Refrigerate macarons for at least 24 hours to allow them to mature a.k.a become soft on the inside and crispy on the outside. Yumm! All your goodies are mouthwatering! I was wondering if you had a recipe for oreshki? I bought an oreshnitsa but am kind of nervous to make them from an untrusted recipe. Can you repeat how you make the filling again? You add no sugar? Just heavy cream and cream cheese. Sure, you can take 1/2 packet cream cheese, 1/4 cup whip cream and about 2-3 tablespoons powdered sugar and 1 tsp vanilla extract and whip it together until you get fluffy and smooth cream. This was the first macaron recipe that I ever tried about 6 years ago and back then I did not know that traditionally macarons are not made with creams like this because the macarons absorb the moisture too much. So while it was tasty (the middle becomes very chocolate and gooey), if you do not plan on eating it within 24 hours, use a different frosting (butter based). The macaroons were heavenly! I can definately see why the french go crazy for them! what filling do you use for these cookies? they look delicious!!!! !